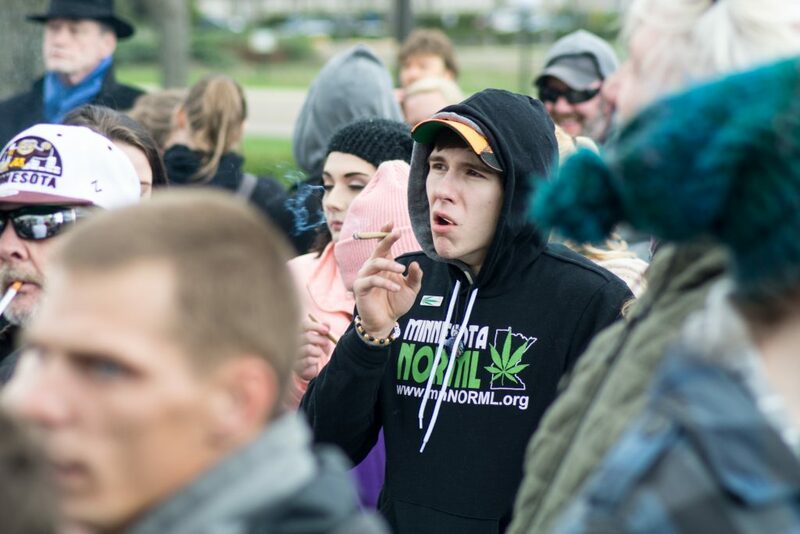 Local politicians and citizens rallied at the Minnesota State Capitol on April 20 to legalize marijuana. Speakers inside the rotunda implored Minnesotans to add their voices to the conversation and then provided various reasons that citizens should care. House File 926 and House File 927 are two bills introduced in February intended to legalize consumption of marijuana for personal use. However, Rep. John Applebaum (D-44B) stated that Republicans aren’t likely to give it a fair hearing. Applebaum, chief author of HF 927, opened his speech by saying that he was told he’d risk political suicide for pursuing legalization. He persists because of a belief that it’s critical Minnesota take advantage of the economic benefits Colorado and Washington are currently enjoying. Rep. Rena Moran (D-65A), who is a co-author on both bills, told attendees that the rotunda was “their house” and that they needed to continue adding their voices to the conversation. Moran paused her speech to single out signs in the room and express her support for their messages. 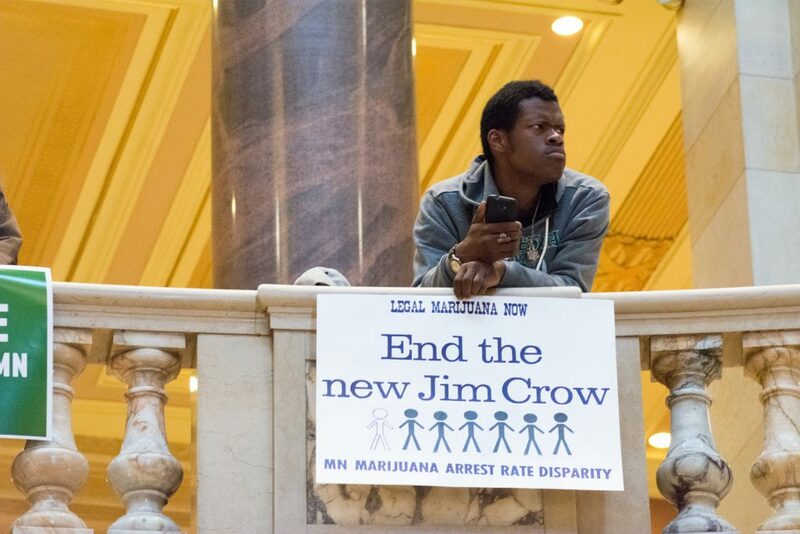 “End the new Jim Crow. Right? Let the people decide. .. It’s going to take all of you,” said Moran. Chris Wright, who announced his candidacy for governor at the rally, dissented from the popular support of these bills, saying that they don’t comply with Article 13 Section 7 of Minnesota’s constitution. Wright’s reasons are that passing a constitutional amendment would make it difficult to challenge in court and cheat Minnesota farmers of revenue. Another candidate for governor, Tina Liebling, said that she was working to draft her own bill to make sure there is a comprehensive discussion on policy. Nekima Levy-Pounds, a candidate for Minneapolis mayor, addressed the crowd twice and said that she was thankful to the Obama administration for looking the other way on enforcing federal marijuana laws. However, she criticized them for not working to release those wrongly imprisoned by the War on Drugs. “So many of our laws and policies are being used to oppress people, especially the poor. Especially people of color,” Levy-Pounds said. Rep. Raymond Dehn (D-59B) related a personal story from when he was addicted to drugs in his youth. Dehn said that he was fortunate that the criminal justice system treats whites like him differently than blacks, and that blacks don’t generally fair as well as he did in prison. “[Mass incarceration] is something we need to change. 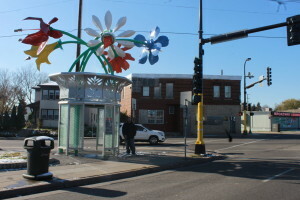 Because criminalization is doing nothing to solve the problems that are currently out there,” Dehn said. Racial injustice within the criminal justice system wasn’t the only topic of discussion for speakers at the rally. Although medical marijuana is legal in Minnesota, speakers detailed problems with access. Joan Smith enrolled in the cannabis program for intractable pain a couple months ago. Smith claims that since using marijuana, she’s nearly eliminated most of the pill medications she used to manage nerve pain. Then she told the crowd a story about how having methadone in the house led to her son’s death. Jeremy Sankey, founder of Minnesota Veterans for Cannabis, told a story about how he was also able to eliminate his use of pain, anti-anxiety, sleep and anti-seizure medication by using cannabis. Smith and Sankey both mentioned financial hurdles, claiming that prescriptions can cost between $300 and $3,000 out-of-pocket per month. After the speakers finished their speeches inside the rotunda, the crowd gathered on the plaza to enjoy entertainment provided by Ganja White Night. When the clock hit 4:20 p.m., rally attendees pulled out joints and pipes to celebrate the moment and pose for photographers. we don’t have medical marijuana in MN, we have a corporate controlled marijuana derivative market. it’s a far cry from actual medical marijuana.